When I first discovered these crayfish I had no idea what species they were. As it turns out, positively identifying invertebrates is often very challenging, and these crayfish were no exception. I visited the crayfish colony one evening after a summer rain storm had passed through. The temperature was relatively low, and the humidity was high. It was my hope that these conditions would encourage the crayfish to come out of their dens. I found this crayfish walking through the grass near his burrow, and managed to collect it easily. My plan was to use this live specimen to help with the identification process. 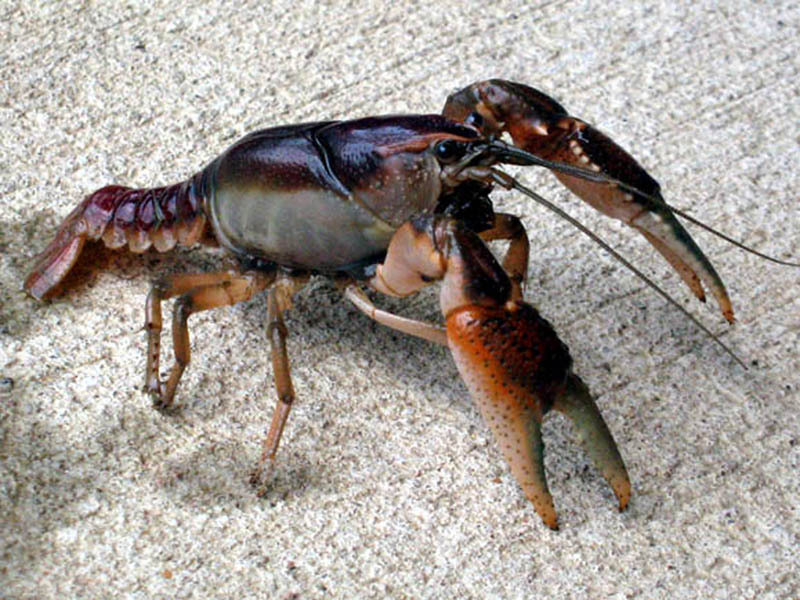 There are over 350 species of crayfish in North America, and at least 36 of them live in Texas. 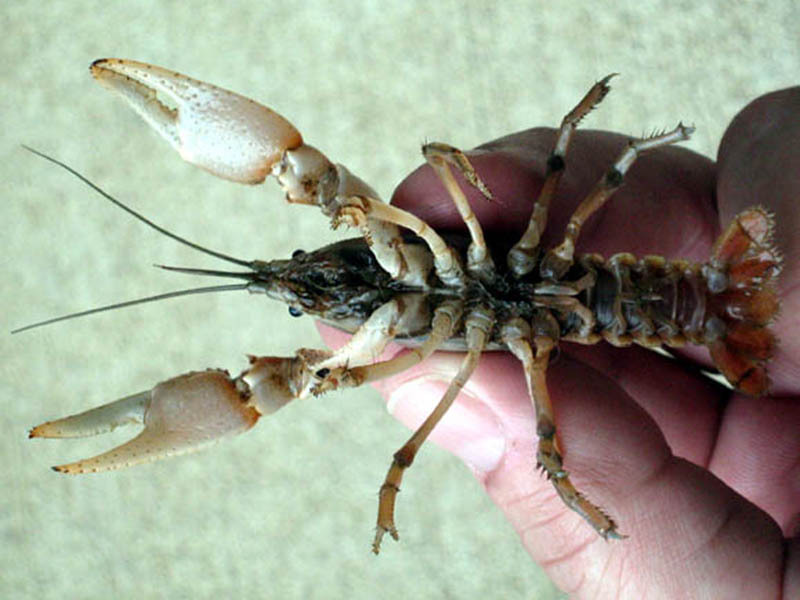 In general, crayfish species are under-studied, and poorly documented. Figuring out which species I had was going to be a challenge. I started my investigation by searching the internet. The information I found there was scarce and incomplete. Eventually, I got some help with the identification on a crayfish enthusiasts message board. 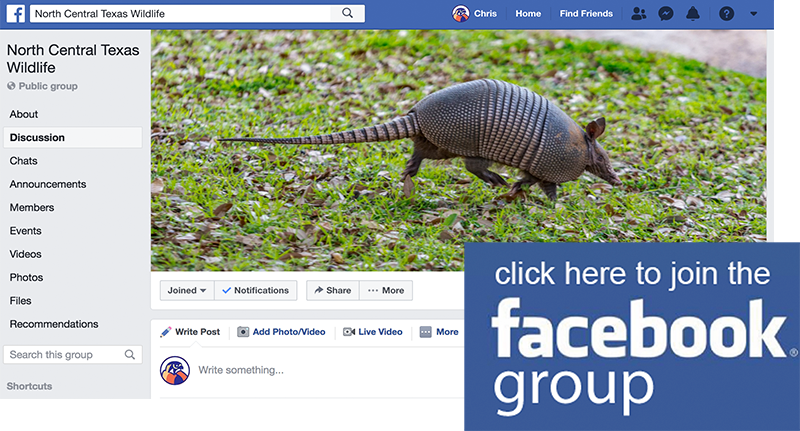 I posted a couple of my pictures, and received the suggestion that what I had was either a Procambarus gracilis, or a Procambarus steigmani; both of which had been found in Texas, but neither of which were documented as living in Denton County where I collected my specimen. 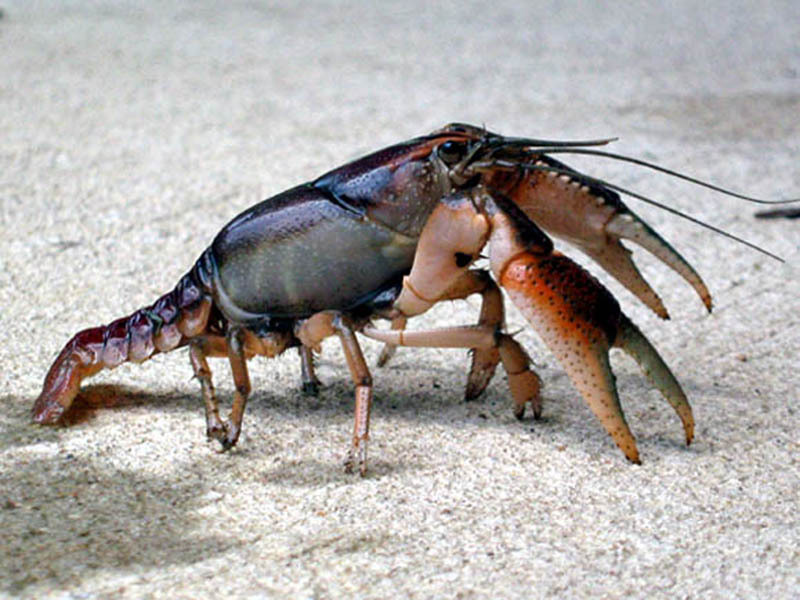 To further complicate the matter, both of these crayfish species are very similar in appearance and behavior. 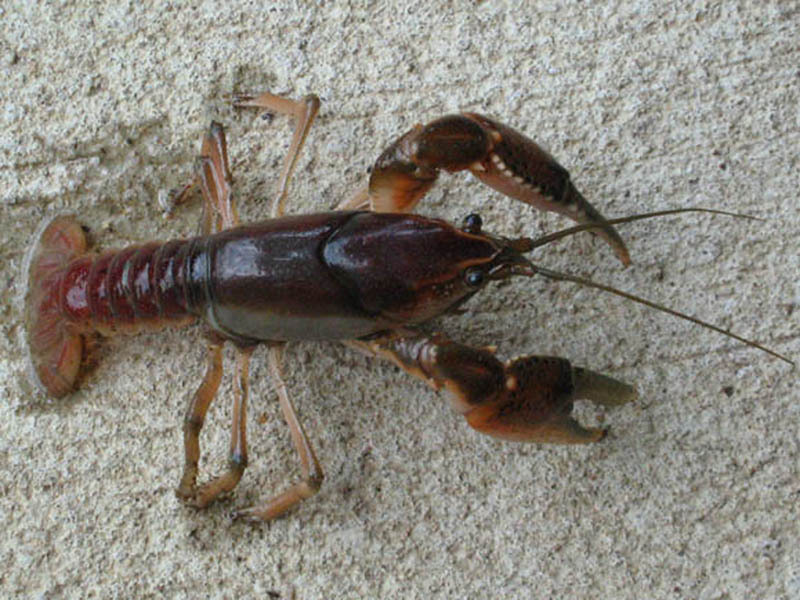 Procambarus gracilis is a well known species from Oklahoma up through the Midwest, but it has only been found in Texas in one county near the Oklahoma border. The Procambarus steigmani, on the otherhand, is a relatively new species, only first identified scientifically in 1991. 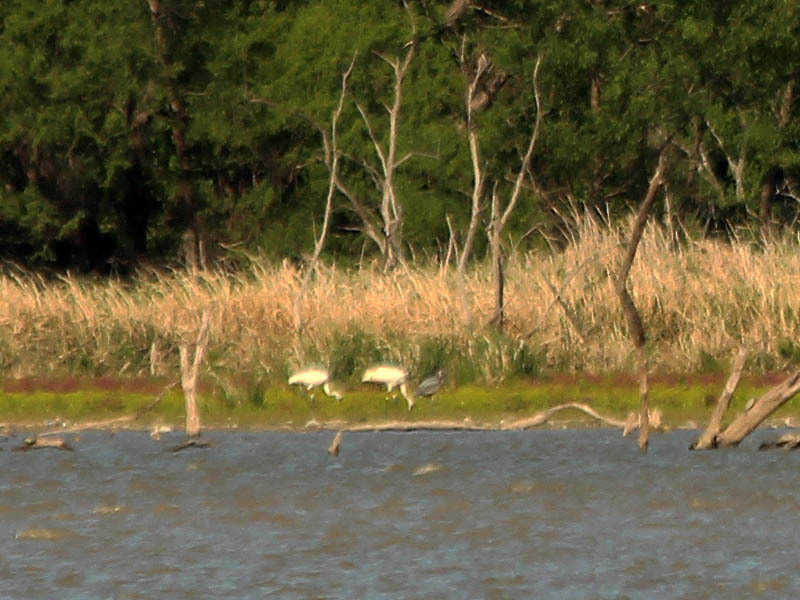 According to the Texas Parks and Wildlife Department website, the Procambarus steigmani is only found in two Texas counties: Collin and Hunt. As Collin county is adjacent to and directly east of Denton County, the Procambarus steigmani became the most likely candidate. Procambarus gracilis and Procambarus steigmani have nearly identical coloration. With deep red color over the dorsal surfaces, and cool gray color on the sides of the carapace, light pink appendage undersides, and dark blue pincherss. Behaviorally, both species are what is know as Primary Burrowers. Primary Burrowers are unique in that they spend the majority of their lives in dens or burrows that they construct themselves. These burrows can be well away from bodies of standing water. Burrows of both species can be up to 6 feet deep, and terminate in a water-filled hollow. The only reliable differentiator between the two species is a subtle difference in the shape of the Form I (reproductive) Male’s gonopods. The gonopods are a pair of appendages used for reproduction. They are located at the base of the crayfish’s tail, and are held close to the body, tucked neatly between the last two pair of walking legs. Careful examination of the gonopods on this specimen revealed that I had discovered a colony of Procambarus steigmani, otherwise known as the Parkhill Prairie Crayfish. Procambarus steigmani, or the Parkhill Prairie Crayfish, is an interesting find for a number of reasons. 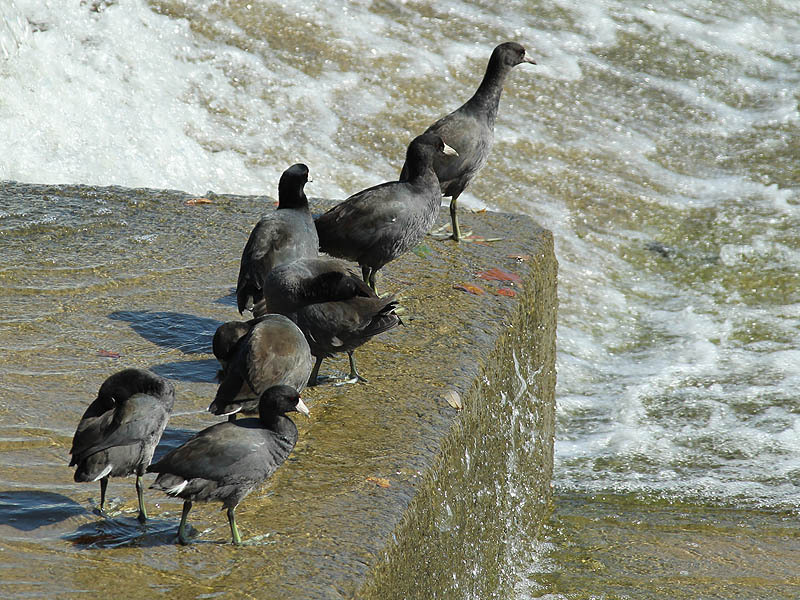 First, they were only just recently described as a new species, with the publication of the required scientific literature occurring in 1991. Further, they are only documented as having a very limited range, covering only areas in Collin and Hunt counties. Because of this exceedingly limited range these crayfish are considered rare, threatened, or endangered by the Texas Parks and Wildlife Department. The specimens I have discovered were found in Denton County just to the west of Collin County in an area where they are not documented to exist. I found this crayfish walking through the grass near his burrow.With this live specimen in my possession, I felt that I would finally be able to identify this species. Unfortunately, I was unprepared for the challenges involved in identifying crayfish species. 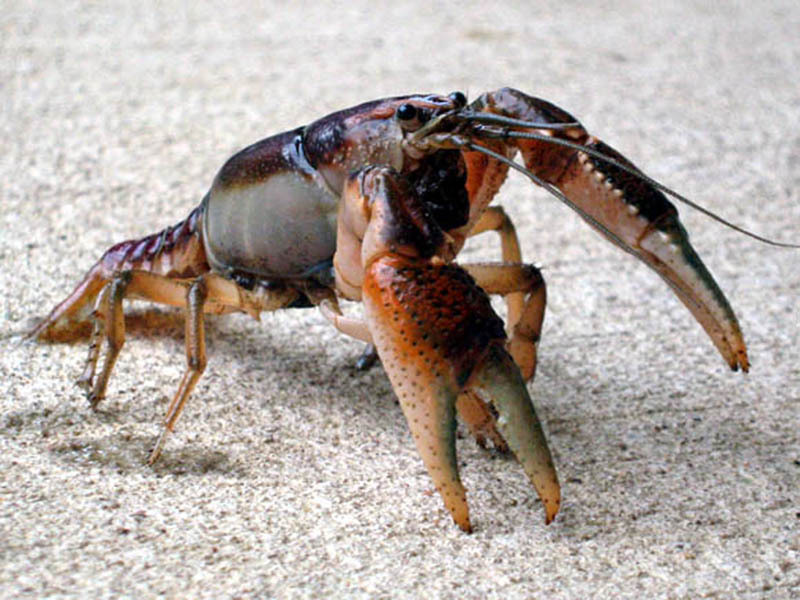 It seems that crayfish in general,and crayfish in Texas in particular, are poorly documented. Barely noticeable in this photograph is the yellow border around the rostrum (the portion of the carapace that extends between the eyes). Also notice how small the tail is on this specimen. It appears to be almost vestigial, possibly a testament to the more terrestrial lifestyle of this particular species of crayfish. The Parkhill Prairie Crayfish I found were located in Denton County just to the west of Collin County in an area where they are not documented to exist. The distinctive yellow border around the rostrum of the Parkhill Prairie Crayfish is more apparent in this photograph. Here is a view of the mouth parts and the light pink undersides of the chela or pinchers. This is a nice photograph of the underside of a Form I Male Parkhill Prairie Crayfish. Notable here are the location of the gonopods which are key to making a positive identification of this species of crayfish. The gonopods are the first pair of pleopods (also known as swimmerets) on the crayfish’s tail or abdomen. The gonopods have been specially modified for reproductive purposes. The gonopods are held against the body of the crayfish between the first two pair of walking legs, and are covered by the second pair of pleopods which sit on top of the gonopods. The second pair of pleopods are the structures visible between the last two pair of walking legs in this photograph. I live in Royse City, Rockwall County. Back in early June, I caught a large male of this species in a small retention pond near my house as a pet for my daughter. Last night, I caught two males and a female, but let the males go. I read they are rare, so I intend to breed them and hopefully, release the young back into the same pond and a creek downstream sometime in the spring. Please let me know if you would like more information. 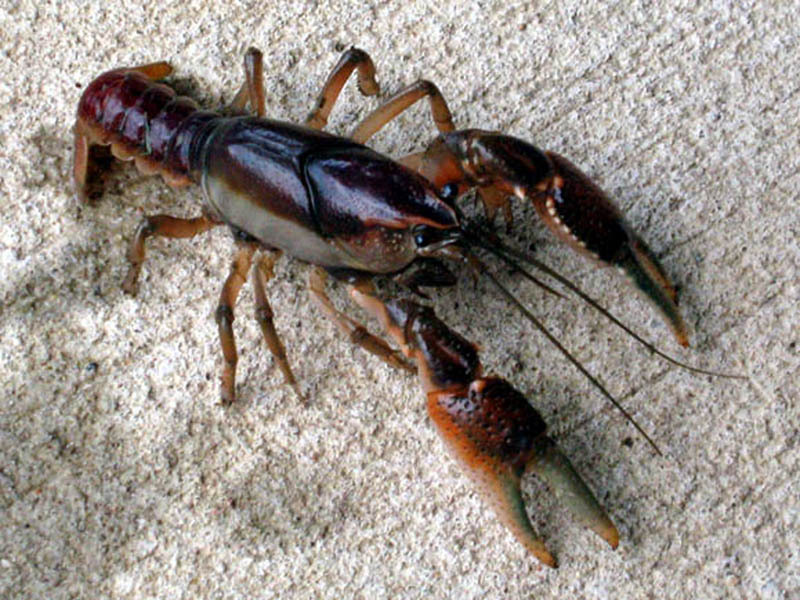 I went to a daycare in Carrolton growing up in the early 1980’s and there at the playground under pecan trees therethere were tons of crayfish…if my memory serves me the pinchiers were a bluish purple while other were of crimson color. The main road that passes old town Carrolton…about three blocks down to the left is a Korean school/church or something. Disclaimer I have passed by but haven’t stopped there in over 30 years! Maybe this will lead you to a new colony. 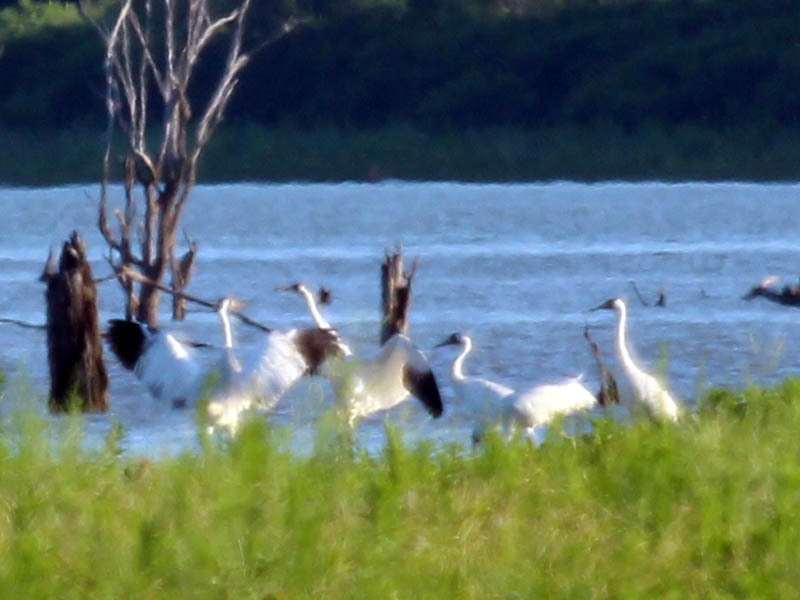 I’ve found them in a’plenty in Caddo Mills as well as north of Greenville close to Honey Creek. 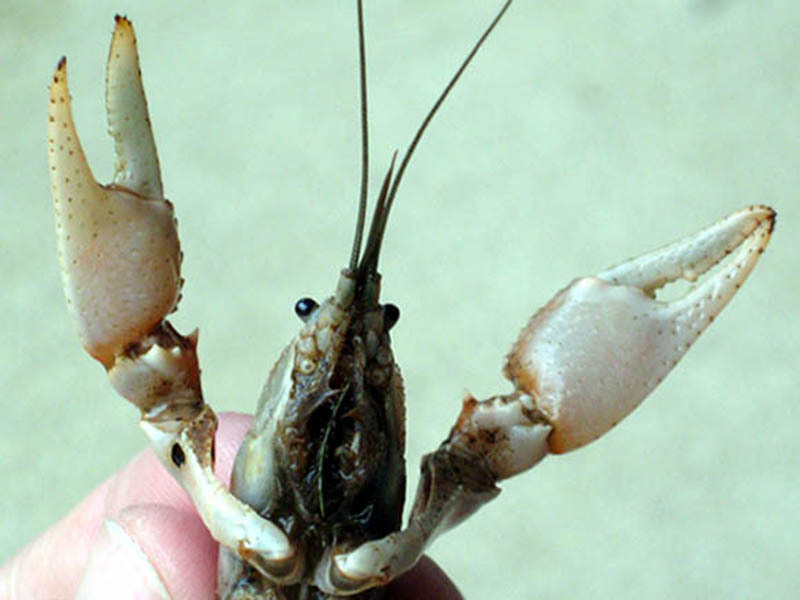 I found similar crawdads that lived in the middle of a field in Arlington Texas. This field I played in as a child also had the multicolored Box turtles . The field is now covered by a School Administration building , a large church and a huge parking lot. I had seen foxes there , roadrunners, many lizards including horny toads and hawks. I wish it could have been saved as a nature area.